Finally, for my blog visitors, I present the font Pinstripe Limo. This is a bold-outline geometric sans serif font I created in 2010, yet another spin-off of my Champagne & Limousines font. This font is not a complete font family at present, lacking italic and bold styles, but I hope that you enjoy it. This font is well suited for display purposes, titles and headings, and even looks well when used in "all capitals" in such settings. 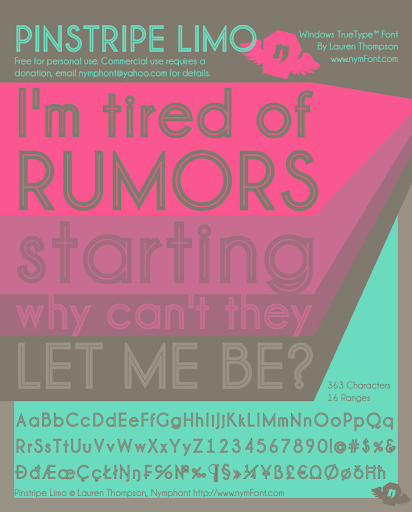 I apologize for my delay in posting about this font as it has been available for some time now. I thought I would write about it though for those that night have missed it. Hope you likes. Feel free to comment!